by: R. C. Cotter, J.-F. Rail, A. W. Boyne, G. J. Robertson, D. V. C. Weseloh, K. G. Chaulk. It is the largest gull in North America. This predominantly marine gull is the least abundant of the four main larids, with an estimated population of 30,980 pairs (61,960 individuals) (Table 1). Reflecting its marine origins, 79% of all Great Black-backed Gulls were found in Atlantic Canada (24,410 pairs) and 13% along the Gulf of St. Lawrence in Québec (4123 pairs) (Table 1; Figures 10, 11); only 8% (2447 pairs) of its population nested along fresh or brackish water, mostly along the St. Lawrence River and Estuary in Québec. Very few nest in the Great Lake system in Ontario; during a comprehensive gull census in 1999–2000 only 36 pairs were counted, and the majority of these were on the Lower Great Lakes system (especially Lake Ontario with 22 pairs). In 2004–2006, there was a die-off of Great Black-backed Gulls due to an outbreak of Type E botulism, and in 2007 only one pair was counted on Lake Ontario (Weseloh 2007a). The coast and off-shore islands of Labrador, Newfoundland, and eastern Nova Scotia (i.e., East Coast) harbour over half of all Great Black-backed Gulls breeding pairs (57%, 17,653 of 30,980 pairs; Table 1) and colonies (64%, 486 of 763 colonies; Table 3). In each province, with the exception of Ontario, the Great Black-backed Gull has more colonies than any other gull species. Of the 763 colonies recorded during recent censuses, only 21 had 250 or more pairs (Tables 4, 6–9) while 92 had 100 or more pairs (Figure 12). Nova Scotia has 13 of these large colonies, including the two largest--Boot Island in the Bay of Fundy with 753 pairs (censused in 2002) and Outer Island in Shelburne County with 628 pairs (in 2002) (Table 6). The third largest colony was found on Île du Chenal (Grande-Entrée lagoon) on Îles-de-la-Madeleine in the Gulf of St. Lawrence in Québec, with 549 pairs (in 2007) (Table 9), while the fourth largest colony was found on Prince Edward Island at Poverty Beach, with 435 pairs (in 2004) (Table 7). The average colony size was slightly larger for the Maritimes, 62 pairs (n=289 colonies), than for Québec, 40 pairs (n=164 colonies) (Table 3). 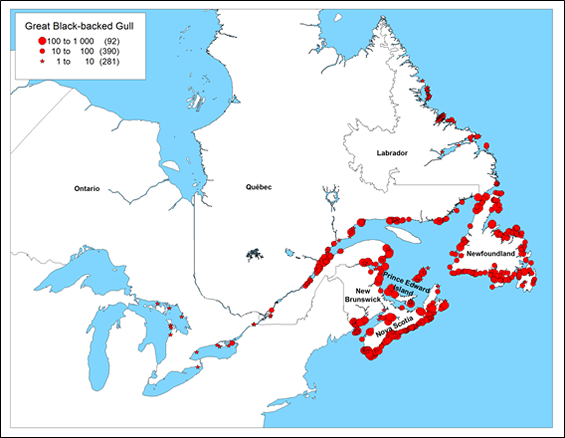 Figure 10: Distribution of Great Black-backed Gull breeding colonies (number of pairs) in eastern Canada (number of colonies in parentheses). This is a map of eastern Canada showing the location of each Great Black-backed Gull nesting colony. Each red dot represents one colony, and the size of the dot represents the number of breeding pairs. There are three dot sizes: from small to large they represent 1 to 9 pairs, 10 to 99 pairs, and 100 to 999 pairs. The number of colonies in each size class is presented in parenthesis to the right of the size class. Figure 11: Proportion (%) of the total breeding population estimate of the Great Black-backed Gull in eastern Canada, by province (A) and waterbody (B). This is a graph for the Great Black-backed Gull with, in part A, a pie chart showing the proportion (%) of its total breeding population that occurs in each province in eastern Canada and, in part B, a pie chart showing the proportion (%) of its total breeding population that occurs in each main waterbody (Great Lakes, Gulf of St. Lawrence, St. Lawrence River and Estuary, Bay of Fundy, and East Coast) in eastern Canada. Figure 12: Frequency of colony size classes (number of pairs) of the Great Black-backed Gull in eastern Canada, by geographic region (A) and waterbody (B). This is a graph for the Great Black-backed Gull with, in part A, a bar chart showing the number of colonies per colony size class in Atlantic Canada, Québec, and Ontario and, in part B, a bar chart showing the number of colonies per colony size class in each main waterbody (Great Lakes, Gulf of St. Lawrence, St. Lawrence River and Estuary, Bay of Fundy, and East Coast) in eastern Canada . There are three colony size classes: from small to large (on the graph, from left to right), 1 to 9 pairs, 10 to 99 pairs, and 100 to 999 pairs. The number of colonies in each size class is presented on top of each bar. 1 This total is a minimum because Labrador has been only partially surveyed for nesting gulls; furthermore, this total includes 771 pairs from mixed Herring Gull and Great-Black-backed Gull colonies for which species was not identified. 2 Includes a Black-legged Kittiwake colony (Cape St. Mary's; 10,000 pairs) that was last censused in 1979. 3 Includes a Ring-billed Gull colony (Pointe de Sandy Beach; 1172 pairs; BIOMQ) that was surveyed in 2004; in 2002 this colony was unoccupied. 4 All Migratory Bird Sanctuaries were surveyed in 2005; colony data from Mingan Archipelago National Park Reserve and elsewhere date from 1990–1999. 5 Most colonies surveyed between 2001 and 2007, however a few were last surveyed in 1990 or 1995. 1 na=not available; for most colonies only an approximate size was recorded (i.e., small, medium, large, or very large; see Methods). Great Black-backed Gull J5RP (Larus marinus) 6cy: December 09 2011, Boulogne-sur-Mer, France (50.42 N - 01.34 E). Picture: J-M Sauvage. Great Black-backed Gull (Larus marinus) JC9S 11CY, December 07 2014, Boulogne-sur-Mer. Picture: Jean-Michel Sauvage. 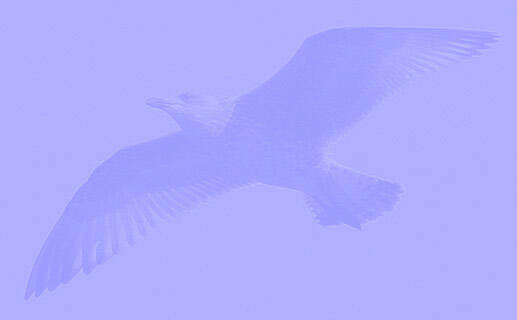 Great Black-backed Gull JHX9 (Larus marinus) 7cy: December 03 2012, Boulogne-sur-Mer, France (50.42 N - 01.34 E). Picture: J-M Sauvage. Great Black-backed Gull (Larus marinus) 5cy JX76 December 15 2011, Scheveningen, the Netherlands. Great Black-backed Gull (Larus marinus) 6cy JZ61 December 01-02 2012, Calais, France. Picture: J-M Sauvage. Great Black-backed Gull (L. marinus) J19X 6cy: December 15 2012, IJmuiden, The Netherlands. Great Black-backed Gull (L. marinus) J78Z 2CY, 5CY, 11CY, November 2008, November 2011 & September-December 2017, the Netherlands & France. Great Black-backed Gull (Larus marinus) JE001 5CY, December 15 2013, Houten, the Netherlands. Picture: Herman Bouman. Great Black-backed Gull (Larus marinus) JU450 adult, December 05 2017, Boulogne-sur-Mer, France. Picture: Jean-Michel Sauvage. Great Black-backed Gull (Larus marinus) NOS 3015633 8CY, December 31 2017, Boulogne sur Mer, France (50.44 N - 01.35 E). Picture Jean-Michel Sauvage. Great Black-backed Gull (Larus marinus) NOS 3001249 11CY, December 29 2017, Boulogne sur Mer, France (50.44 N - 01.35 E). Picture Jean-Michel Sauvage. Great Black-backed Gull (L. marinus) 18cy NOS 370182 December 02 2012, Calais. Picture: J-M Sauvage. Great Black-backed Gull (Larus marinus) NOS 362922 16CY, January 02 2018, Boulogne sur Mer, France (50.44 N - 01.35 E). Picture Jean-Michel Sauvage. Great Black-backed Gull (L. marinus) 18cy NOS 360824 December 03 2012, Boulogne-sur-Mer, France (50.42 N - 01.34 E). Picture: J-M Sauvage. Great Black-backed Gull (Larus marinus) NOS 350149 19CY, December 28 2017, Boulogne sur Mer, France (50.44 N - 01.35 E). Picture Jean-Michel Sauvage. Great Black-backed Gull (Larus marinus) SVS 9159239 5cy-9cy, March 2012-January 2016, Boulogne-sur-Mer, France. Picture Jean-Michel Sauvage. Great Black-backed Gull (Larus marinus) A7PC adult, December 08 2010, Boulogne sur Mer, France (50.44 N - 01.35 E). Picture Jean-Michel Sauvage. Great Black-backed Gull SK3T (Larus marinus) adult: December 10-19 2012, Boulogne-sur-Mer, France (50.42 N - 01.34 E). Picture: J-M Sauvage. Great Black-backed Gull (Larus marinus) 1AP 4CY-5CY, December 2013 & May 2014, Howth, Dublin, Ireland. Picture: Graham Prole. Great Black-backed Gull (Larus marinus) 2E2 adult, April 21 2012 - July 28 2013, Sandy Point Beach - Plum Island. Picture: Steve Arena, Jorge de Leon & Jeffrey Offermann. Great Black-backed Gull (Larus marinus) 7P1 adult, December 20 2011, Isles of Shoals. Picture: Lauren Kras. Great Black-backed Gull (Larus marinus) NLA 6.038.628March 2007, October 2011 & October-December 2015, IJmuiden, the Netherlands. Great Black-backed Gull (Larus marinus) adult, December 26 2016, IJmuiden, the Netherlands. Great Black-backed Gull (L. marinus) adult: December 15 2012, IJmuiden, The Netherlands. P10 growing. PMS=49. Great Black-backed Gull (L. marinus) adult: December 20 2014, IJmuiden, The Netherlands. P10 growing. PMS=49. Great Black-backed Gull (L. marinus) adult: December 15 2012, IJmuiden, The Netherlands. P9 growing, P10 old. PMS=41/42. Late moult. Suggestion of growing S2? Lots of brown old coverts in wing. Great Black-backed Gull (L. marinus) adult: December 15 2012, IJmuiden, The Netherlands. P9-P10 growing. PMS=47. Great Black-backed Gull (L. marinus) adult: December 15 2012, IJmuiden, The Netherlands. P10 growing. PMS=48. Great Black-backed Gull (L. marinus) adult: December 20 2014, IJmuiden, The Netherlands. PMS=50. Great Black-backed Gull (L. marinus) adult: December 20 2014, IJmuiden, The Netherlands. P9-P10 growing. PMS=47. Great Black-backed Gull (L. marinus) adult: December 20 2014, IJmuiden, The Netherlands. P9-P10 growing. PMS=48. Great Black-backed Gull (L. marinus) adult: December 15 2012, IJmuiden, The Netherlands. P9-P10 growing. PMS=46. Great Black-backed Gull (L. marinus) adult: December 20 2014, IJmuiden, The Netherlands. P10 growing. PMS=48. Great Black-backed Gull (L. marinus) adult: December 20 2014, IJmuiden, The Netherlands. P9-P10 growing. PMS=49. Great Black-backed Gull (Larus marinus) adult: December 03 2007, Den Oever, The Netherlands. Picture: Fred Visscher. Great Black-backed Gull (L. marinus) adult: December 15 2012, IJmuiden, The Netherlands. Great Black-backed Gull (L. marinus) adult: December 20 2014, IJmuiden, The Netherlands. Great Black-backed Gull (Larus marinus) adult: December 18 2009, IJmuiden, the Netherlands. Great Black-backed Gull (L. marinus) adult: December 15 2011, Scheveningen, The Netherlands. Great Black-backed Gull (L. marinus) adult: December 20 2014, IJmuiden, The Netherlands. Yellowish legs.